1 of 4 In a large bowl, whisk together flour, baking powder, baking soda and 1/4 tsp of the salt. In another bowl, beat 1 of the whole eggs, then whisk in buttermilk, sugar and melted butter. Stir dry mixture into wet mixture until just combined. In a third bowl, whisk together remaining 2 whole eggs, the egg whites, remaining 1/4 tsp salt and the pepper. 2 of 4 Heat silver dollar pan over medium heat. Coat with nonstick cooking spray. Spoon 2 tbsp of the batter into each cavity; spread batter with an offset spatula if necessary. Cook pancakes until bubbles appear, about 2 minutes. Flip and cook 1 minute, until browned. Remove pancakes; spray pan again and cook 5 more pancakes (2 cavities will be empty). Remove pancakes and spray again. Pour beaten egg mixture evenly into 6 of the cavities. Cook 1 to 11/2 minutes; flip and cook another 30 seconds. 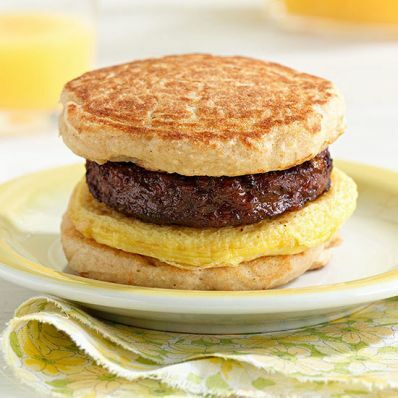 3 of 4 To assemble: Stack an egg patty on top of a pancake; add an unwrapped frozen sausage patty and top with another pancake. Freeze in individual resealable bags until using. 4 of 4 To serve: Wrap frozen sandwich in a paper towel and reheat on a microwavesafe plate for 45 seconds. Flip sandwich and heat another 30 to 45 seconds, until heated through.